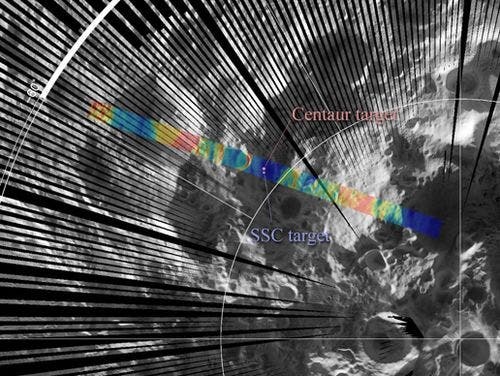 It’s been one year since NASA Lunar Crater Observation and Sensing Satellite (LCROSS) smashed into the moon and now astronomers are confirming that there are in fact lunar craters on the moon with reservoirs of ice water, along with various other substances. The LCROSS mission crashed on the south pole of the moon, where previous NASA observations had found hydrogen, while a second spacecraft flew by the debris site from the crash landing explosion where a search for signs of water showed positive results. According to the NASA study, nearly 200 pounds of water were discovered from the plume, while an Oct. 22 Science report upped that number to 341 pounds. Based on the explosion size astronomers now believe that up to 5.6 percent of the soil tossed up by LCROSS contained some form of water ice. The earlier Apollo flights, it turned out, went to the least interesting parts of the moon, its sterile, desert-like midlands. The truly interesting places are craters, like Cabeus, in the polar-regions where the moon's secrets tend to migrate and are then held in place by minus 390 degree F temperatures. What NASA found was water, lots of it. NASA estimates that the dirt in the targeted crater is 5.6 percent water, the equivalent of 1 billion gallons. The probes also discovered traces of carbon monoxide and dioxide, ammonia, sodium, mercury, silver, sulfur and methane. But the true importance was finding water. Water and the oxygen from it could sustain a manned lunar base. The oxygen and water's other component, hydrogen, could provide rocket fuel for space flights from a base on the moon. And having water already on the moon would save the expense ― $50,000 a pound ― of supplying it from Earth. Unfortunately, this discovery is likely to be of little practical use, at least to the United States. The Obama administration cancelled NASA's plans for a manned return to the moon in the next decade in favor of a bolder but still largely abstract plan for a manned landing on a near-Earth asteroid and an eventual mission to Mars. At the very least NASA's discovery of sufficient water to sustain a lunar base should cause the Obama administration to rethink its plans to abandon the moon program. Otherwise, India says it will attempt a moon landing in 2020 and China says it will do likewise in 2025. Maybe they can find a use for NASA's breakthrough. Scientists recently solved how the Moon is producing its own water. The Moon acts like a big sponge of sorts. The lunar surface is a loose collection of irregular dust grains, known as regolith. Basically, the regolith absorbs electrically charged particles given out by the Sun. These electrically charged particles interact with molecules of oxygen that are already present in lunar dust, and voila, you have H2O. Incoming protons are trapped in the spaces between the grains, absorbed, and then interact with the oxygen in the lunar regolith to produce hydroxyl and water. This discovery, made by SARA (an instrument jointly built by scientific groups from Sweden, India, Japan, and Switzerland an attached to the Chandrayaan-1 lunar orbiter that finished its mission in August 2009) should help pave the way for understanding if, and how, a lunar base could rely on moon water for its human inhabitants. “Current imaging techniques use the reflection of light from the surface. It is possible to determine surface composition by taking images at different wavelengths – but this only allows to constrain the mineral composition (minerals are composed of different elements) of the material,” Koschny explained to The Daily Galaxy.